The forms in your federal grant application take quite a journey before getting to your computer. Every form requires input and coordination from four key stakeholders: the Office of Management and Budget (OMB), the federal agency that posted the grant, the Federal Register, and Grants.gov. These stakeholders play different roles in the content and technical development of the form. And, start to finish, updating or creating a new grant application form can take up to nine months. 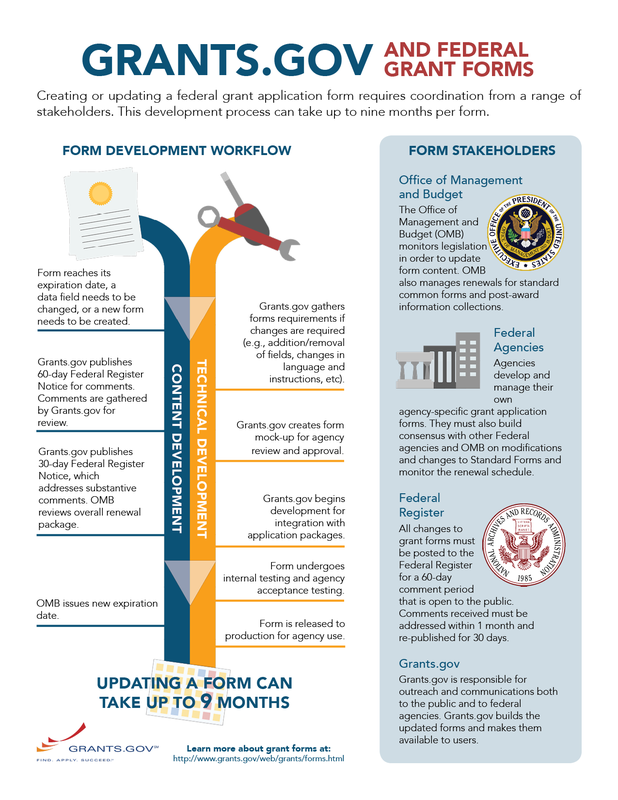 The following infographic depicts, at a high level, the grant form creation and renewal workflow. You can also access an HTML version of the graphic here. Do you have questions about the forms development process? Share them with the community in the comment section below. we are seniors living in a HUD property. Are there any grants available to help us on a social/recreational level?